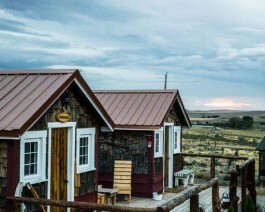 Remodeled in 2015, these cute duplex cabins are in a unique location, out in the country with majestic views only 10 minutes from downtown Cody. The Hemingway’s cabin has a western style with brand new log furniture and a queen bed. Kim’s cabin is Scandinavian inspired, light and bright with a queen bed also. Each has it’s own bathroom, mini fridge, coffee maker, shared deck and charcoal grill. Enjoy endless hiking possibilities and a bonfire by the water canal. Open May-October. No pets, but boarding for horses is available for an additional charge.